Margaret Graham, 74, has her blood pressure checked while visiting the Wake Forest Baptist Medical Center in Winston-Salem, N.C., on Friday, July 13. She had participated in a multi-year study, published on Wednesday investigating a connection between high blood pressure and the risk of mental decline. “I feel like maybe with this study, some findings may come that will develop new drugs and also new activities, exercise, theories that will help people to maintain an acceptable blood pressure level,” Graham says. 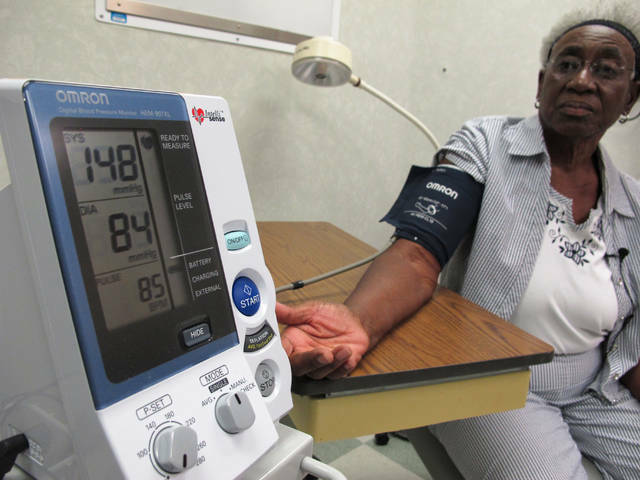 CHICAGO (AP) — Lowering blood pressure more than usually recommended not only helps prevent heart problems, it also cuts the risk of mental decline that often leads to Alzheimer’s disease, a major study finds. It’s the first time a single step has been clearly shown to help prevent a dreaded condition that has had people trying crossword puzzles, diet supplements and a host of other things in hope of keeping their mind sharp. In the study, people treated to a top blood pressure reading of 120 instead of 140 were 19 percent less likely to develop mild cognitive impairment. They also had fewer signs of damage on brain scans, and there was a possible trend toward fewer cases of dementia. He led the study and gave results Wednesday at the Alzheimer’s Association International Conference in Chicago. They’re considered preliminary until published, expected later this year. Independent experts cheered the news. “We have long known that high blood pressure is bad for your heart. Now we’re also learning it’s bad for your brain,” said James Hendrix, director of global science initiatives at the Alzheimer’s Association. About 50 million people worldwide have dementia, and Alzheimer’s is the most common type. There is no cure — current medicines such as Aricept and Namenda just ease symptoms — so prevention is key. Roughly half of adults in the United States have high blood pressure under guidelines adopted last year that define it as a top number of 130 or more, rather than 140. Normal is under 120. High pressure can damage blood vessels and has long been linked to a higher risk for dementia. But it’s not been known if lowering pressure would reduce that risk or by how much. The federally funded study was designed to test this in the most rigorous way. It involved more than 9,300 people with high pressure. Half got two medicines, on average, to get their top reading below 140. The rest got three drugs, on average, and aimed for 120. During the study, the top pressure averaged 121 in the intensive-treatment group and 135 in the other group. The study was stopped in 2015, nearly two years early, when it became clear that lower pressure helped prevent heart problems and deaths. But tests of thinking skills continued for two more years, and these new results were revealed on Wednesday. Researchers saw a 19 percent lower risk of mild cognitive impairment, or MCI, in the intensive-treatment group — 285 cases versus 348 in the higher pressure group. About half of people with MCI develop dementia over the next five years. “It’s really more important to prevent MCI than dementia in some ways. It’s like preventing high cholesterol rather than a heart attack,” Williamson said. There also were fewer dementia cases in the intensive-treatment group but there were too few to say lower blood pressure was the reason. Dementia takes longer to develop than mild impairment does, so doctors think the difference may widen over time. MRI scans on 454 participants showed that those in the lower pressure group had less white matter lesions — areas of scarring or damage from injury, such as inadequate blood supply. “It matches” the other results on thinking skills and bolsters the evidence that lowering blood pressure helps, said Laurie Ryan, a dementia scientist at the National Institute on Aging. The study did not test specific blood pressure drugs. Instead, each participant’s doctor chose which ones to use from the more than a dozen available. When the heart results were announced a few years ago, doctors said that too-low pressure, fainting episodes and some kidney problems were a little more common in the intensively treated group but that those risks were considered worth the benefits of a lower risk of heart trouble and death. https://www.limaohio.com/wp-content/uploads/sites/54/2018/07/web1_121016946-634e9e2123f44979a69b1d8d2d3b1636.jpgMargaret Graham, 74, has her blood pressure checked while visiting the Wake Forest Baptist Medical Center in Winston-Salem, N.C., on Friday, July 13. She had participated in a multi-year study, published on Wednesday investigating a connection between high blood pressure and the risk of mental decline. “I feel like maybe with this study, some findings may come that will develop new drugs and also new activities, exercise, theories that will help people to maintain an acceptable blood pressure level,” Graham says.